Tuesday November 19th 1878 Hatt was much better today she sat up part of the day. We had threshers today. Win came over and helped get the dinner. We set the table for the boys in the sitting room and the men ate in the dining room the men stayed all night. John McCallister was here for supper. I knit a little in the evening. Wednesday November 20th 1878 I worked at the housework all the forenoon during the last of the ironing. I sewed all the afternoon and evening doing mending. 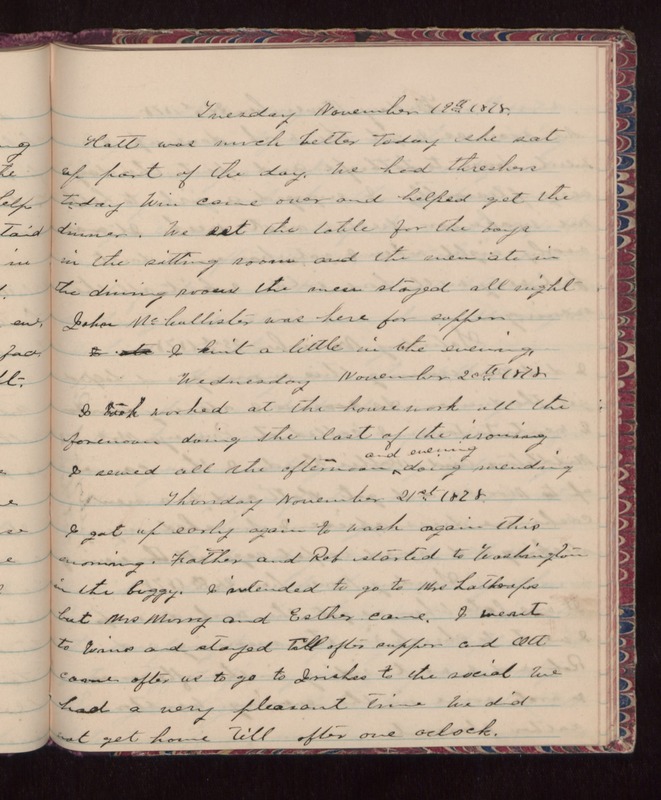 Thursday November 21st 1878 I got up early again to wash again this morning. Father and Rob started to Washington in the buggy. I intended to go to Mrs Lathrops but Mrs [Murry?] and Esther came. I went to Wins and stayed till after supper and Ott came after us to go to [Irishes?] to the social. We had a very pleasant time. We did not get home till after one oclock.